Ever have one of those vacations that was so fun, it required a vacation just to recover? Yeah, you know what I’m talking about, don’t you? It’s awesome when that happens. Recently, I was sent to New Zealand to cover an Ironman race in Taupo, on the North Island. Since Neil signed up for the race, we decided to make it a “working vacation” of sorts — after he finished the race and I turned in my coverage, we’d take two weeks in a camper van, exploring the North and South Islands. Normally, post-race vacations are built around buffets and naps — many, many buffets and naps. But New Zealand is not really a place for either activity. Everywhere you turn, there’s another trail to explore or lake to swim in. The people are charming, the scenery is gorgeous, and the energy is infectious. 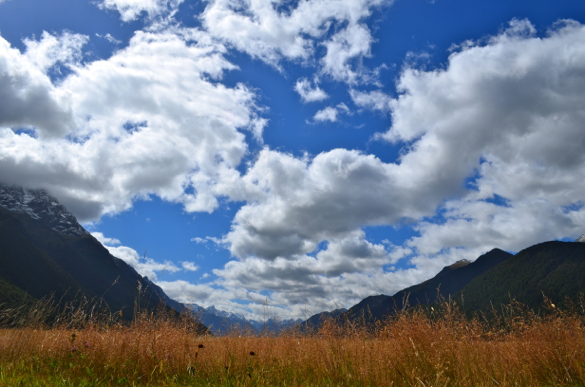 After two weeks exploring New Zealand, we left exhilarated, exultant, and … exhausted. 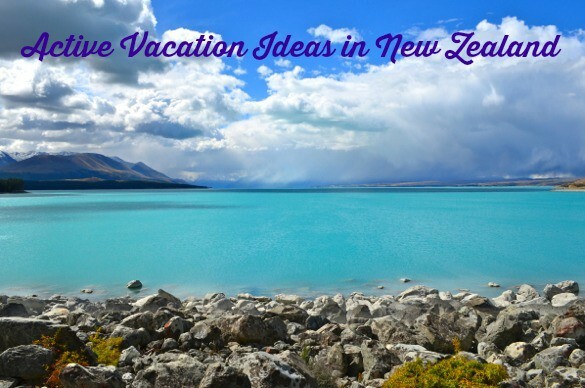 From the northernmost shore to the stunning glacial streams of the south, here’s how you can get your Fit Bottomed Fix in Kiwi Country! 1. Sea Kayaking at Hahei Beach. One of the most iconic images of New Zealand is Cathedral Cove. To get there, you could take a water taxi, but where’s the fun in that? 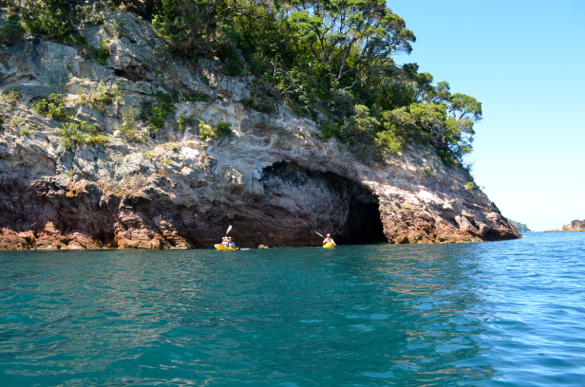 Grab a kayak and depart from Hahei Beach, where a quick paddle through caves and over pristine waters takes you to right to your destination. Once you’re at the cove, set aside the kayak in favor of a day of swimming and picnicking. You won’t want to leave! 2. Caving in Waitomo. 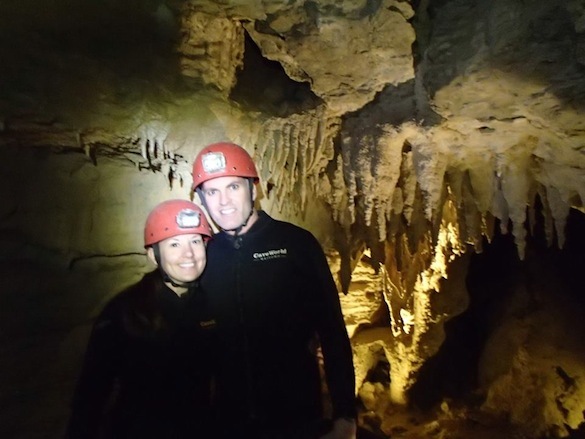 This adventure is not to be missed — hike down into the caves below Waitomo, climb rift passages, pull yourself along ropes courses and spelunk through the chilly waters. Just when you think you’ve had enough, turn off your headlamp, lie on your back and float — the walls and ceiling of the cave are covered in luminescent glowworms, creating an ethereal underground experience. 3. Swimming in Lake Taupo. Though I didn’t race Ironman New Zealand, I did get a chance to swim in the waters of Lake Taupo, where the 2.4-mile swim leg of the race takes place. It’s got some of the most crystal-clear waters I’ve ever experienced, even more clear than Lake Tahoe. Multiple swim races are held in Taupo each year, including the famed Across The Lake Swim. 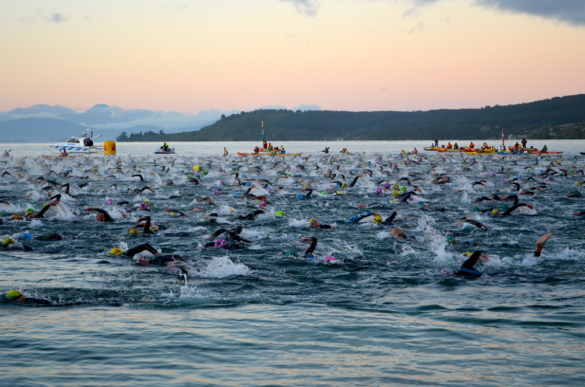 The swim start at Ironman New Zealand, which takes place in Lake Taupo. 4. 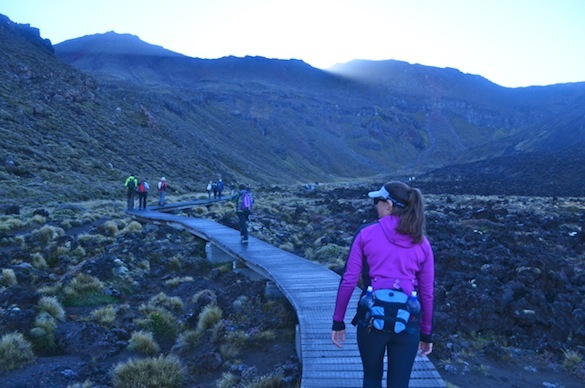 Hiking Tongariro Crossing. If you’re a fan of the Lord of The Rings and Hobbit movies, you’ll recognize parts of the Tongariro Alpine Crossing as “Mount Doom” from the movies. If you’re not a Hobbit-teer, you’ll still appreciate this challenging 20-kilometer (13-mile) hike, which starts out easy, then offers an opportunity to turn back before it increases in intensity. No fanny pack jokes, please. After your hike, I guarantee you’ll look back at the mountain with a sense of well-deserved bad-assery. It’s that cool. 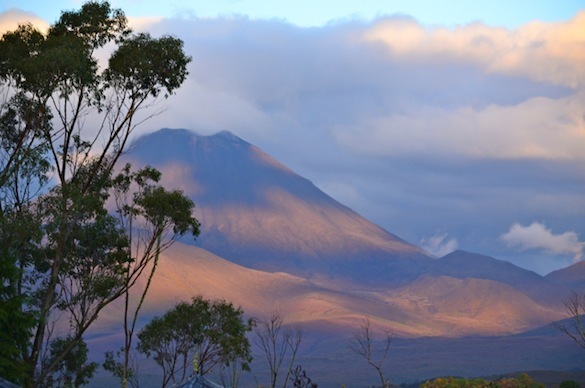 Mount Ngauruhoe, part of the Tongariro Crossing. 5. 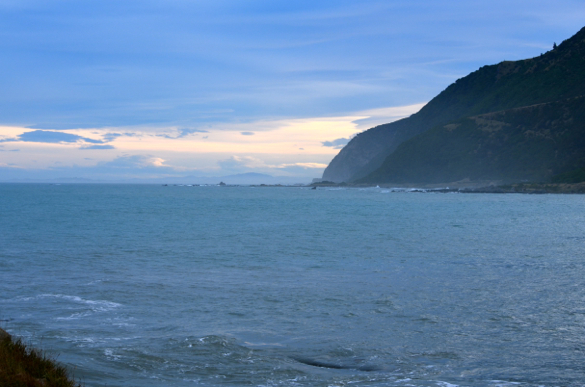 Surfing and Stand-Up Paddleboarding in Kaikoura. In addition to being one of the most beautiful places you’ll ever visit, Kaikoura offers the most reliable waves for surfing. 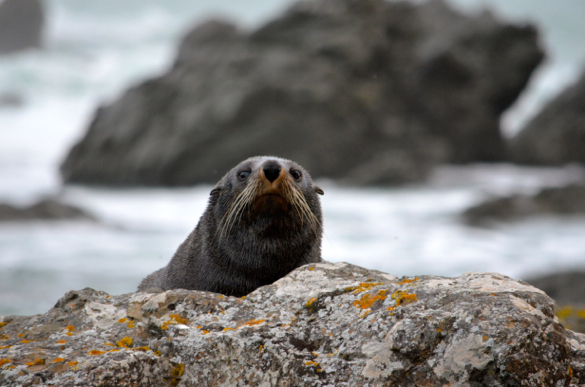 Follow the Kaikoura Surf Report for the latest updates, and hit up Mangamaunu for the best waves. If calm waters are your thing, multiple shops in Kaikoura offer paddleboard rentals and will point you in the direction of the best SUP waters, where you can make some new friends. Who’s a good buddy? Who’s a good buddy? 6. Alps2Ocean Cycle Trail. More than 300 kilometers (186 miles) of Alps2Ocean bike paths await visitors who wish to explore New Zealand on two wheels. Most people make a multi-day adventure of the trip, stopping along the way to camp and take in the scenery along the trail, which winds from Mount Cook to the oceanside community of Oamaru. Off the trail, the villages offer laid-back patios with lounge chairs to rest your weary legs. What’s more, you’re never far from a great cup of coffee — a must for any long-haul cycling adventure! 7. 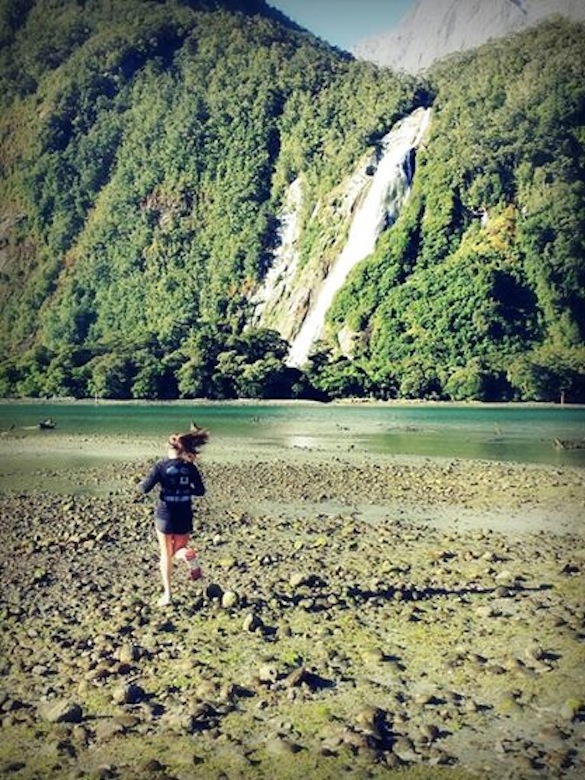 Trail Running at Milford Sound. There’s an extensive network of trails in New Zealand — some are a quick jaunt, while others require multiple days to traverse. Whatever distance you fancy, you won’t be disappointed. The trails are well-maintained, and runners will enjoy logging their miles amidst the flora and fauna of New Zealand. The best trails, though, are at Milford Sound, where every turn promises another breathtaking view. Told you it was beautiful! Definitely not your average running trail! If you’re an endorphin junkie looking for your next vacation spot, you’ll definitely want to head to New Zealand. Just make sure to plan a few extra vacation days when you come home … you may want a buffet and a nap! Any recommendations for a travel agent? I’m excited to see so much active ideas for New Zealand. I knew there was hiking and surfing, but you’ve shown even more fantastic options!